'Benda Kaalu On Toast' - The unique title of the latest play by the renowned playwright Girish Karnad raked up my nostalgia, and fond memories of my childhood started brimming in my mind. 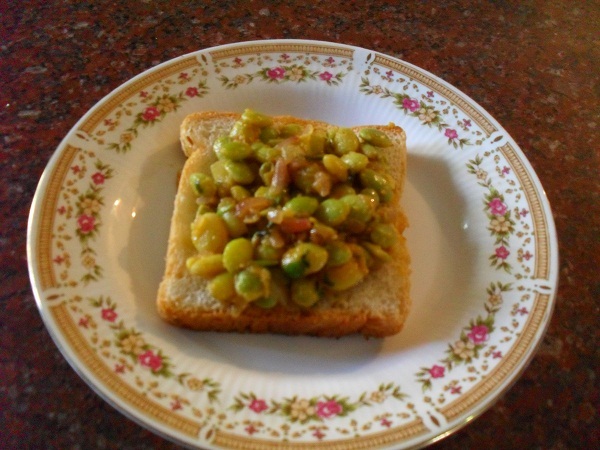 I remembered the delicious Peas On Toast which I enjoyed with my parents and siblings at Sri Kanteerava Narasimharaja Sports Club, Mysore. 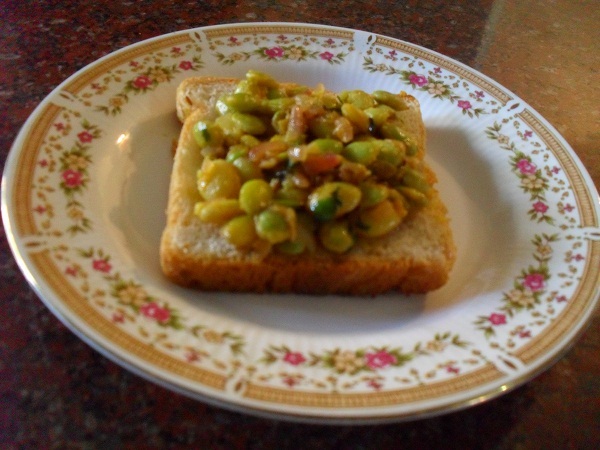 Secondly I felt an unsupressable urge to taste THE DISH - BENDA KAALU ON TOAST - NOW! Both the thought processes culminated in bringing out this post! 1. 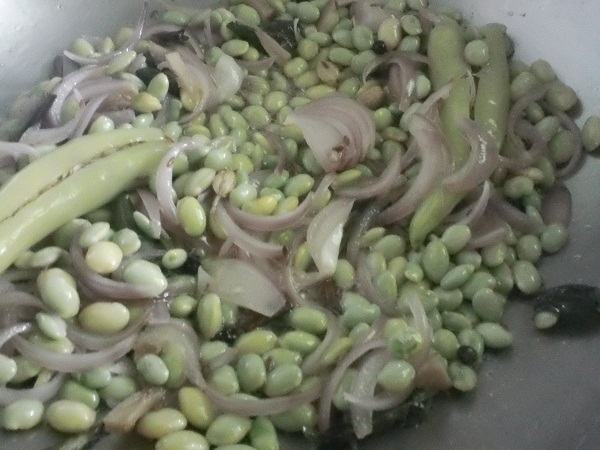 Boil Field Beans/Kaalu in enough water adding one pinch of salt. 2. Drain the cooked Kaalu and keep aside. 3. Crush the ginger and garlic together using a mortar and pestle and keep aside. 5. When the seeds puff up add the crushed ginger and garlic. 6. Add the finely chopped onion and fry till they become golden in colour. 7. Keep a low flame and add the sambar powder and salt. 8. Retain one table spoon of Kaalu and stir the rest into the pan. 9. Mash the retained Kaalu with one table spoon of chopped coriander leaves using a mixer or a mortar and pestle since the quantity is not much. 10. Add the mashed coriander and beans mixture to the Kaalu in the pan and stir well. 11. Cook till the Kaalu curry becomes thick and comes together. 12. 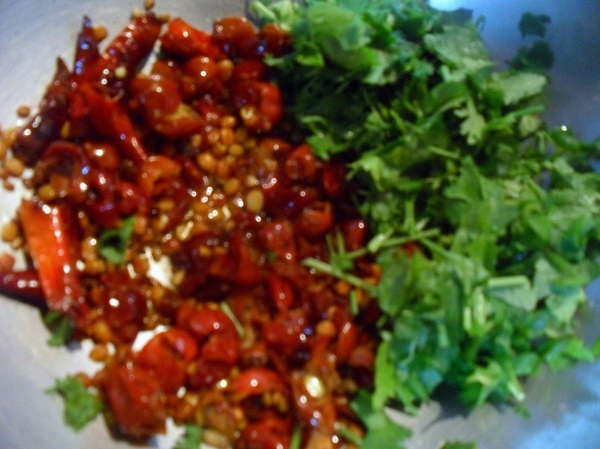 Mix in the lime juice and the remaining coriander leaves. Benda Kaalu is now ready. 1. Place a thin slice of butter on the tava and heat it on low flame. 2. 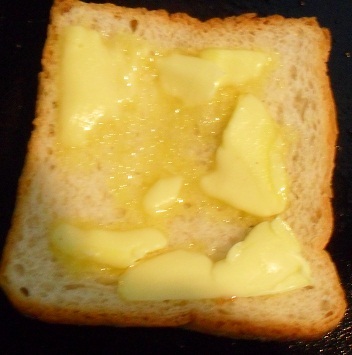 When the butter starts melting, place a slice of bread on the center and toast on low heat. 3. 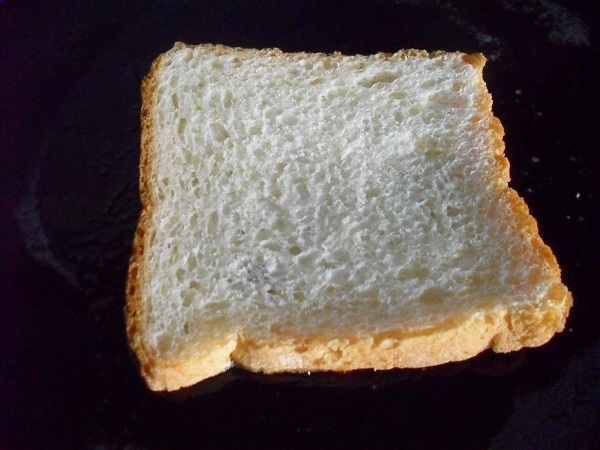 Gently push the bread slice around the tava using a spatula so that it absorbs all the butter melting around. 4. When the bottom becomes golden in colour place another thin slice of butter on top of the bread slice. Do not flip. 5. Top it with a thick layer of the Benda Kaalu. 6. Remove it on to a serving plate. 7. Repeat the procedure for the rest of the toasts. Start biting into the luscious layer of the benda kaalu and proceed into the soft and buttery top portion of the bread slice, and experience the bliss when you arrive at the heavenly golden crunch at the bottom.The effect of the explosion of the flavour and taste of Benda kaalu On Toast on the taste buds is tantalizing! Do not forget to sip a strong filter coffee in between bites to enhance the rich experience. 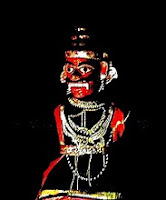 Yelchi Hannu / Elanda Pazham is offered to Sun God during Sankranti pooja. In the evening children are seated on a decorated plank and an elderly lady of the family waves a cup full of Ellu Bella, Yelchi Hannu and coins around their heads which is later thrown far away from their sight.This ritual is supposed to ward off any negative energy ( evil eyes) which might have befallen the children. On the next day rice balls, Pongal, Sugar Cane pieces, pieces of Banana fruit and Yelchi Hannu are served on a turmeric leaf and left in the court yard for the crows to feast. After all these rituals are over, I usually discard the remaining Yelchi Hannu as no one likes to eat the strong smelling fruit. 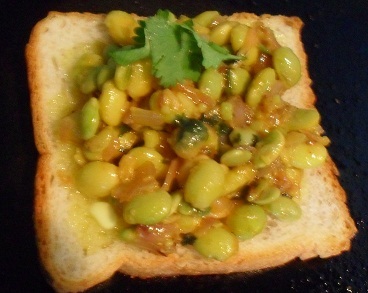 This time I tried sneaking the Yelchi Hannu into a Chutney and surprisingly every one seemed to relish it! 1. Wash the Yelchi Hannu thoroughly and remove the stems and the seeds. 2. Retain the skin and the flesh of the fruits. Do not worry if you find no flesh in some fruits. 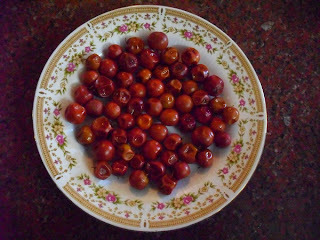 The dry peels can still be used for the Chutney as they will be quite tangy. 4. When the mustard seeds splutter add the dals and fry till golden in colour. 5. Add broken red chillies and the asafoetida and fry till the chillies turn crisp. 6. Add the prepared Yelchi Hannu and saute for a minute. 7. Stir in chopped coriander leaves and switch off flame. 8. When the ingredients are cooled grind them into a slightly coarse Chutney adding salt and powdered jaggery. Relish the thick ( gatti) Yelchi Hannina Chutney with steaming hot rice topped with a spoon of fresh ghee. Add little water and loosen the chutney if you like to use it as a dip. 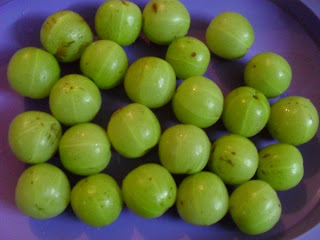 Starting from Uttaana Dwaadashi my mother-in-law saw to it that Nellikkai / Amla was included in our daily menu as long as the gooseberry season lasted. 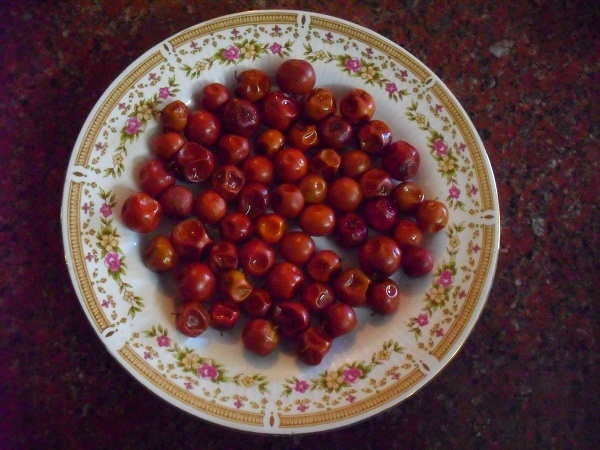 She prepared Chutneys, Pickles, Pachchadies, Tokkus and Spicy Rice using the wonder berry which is filled with many essential nutrients beneficial to health. Of all the Nellikkai dishes prepared Mor Nellikkai was and is still my favourite. I love to start my meal with this delicious pickle mixed with at least one morsel of rice. 1. Wash and wipe the Nellikkais dry. 2. Make small incisions between the segments of the Nellikkai without cutting them into separate pieces. 3. Heat sesame oil in a heavy bottomed pan and add the mustard seeds. 4. When the mustard seeds splutter add asafoetida and the slit Nellikkai. 5. Add half of the salt and stir well and lower the flame. 6. Cover it with a lid. The Nellikkai will release juice and cook in its own steam. 7. Stir now and then to avoid burning. 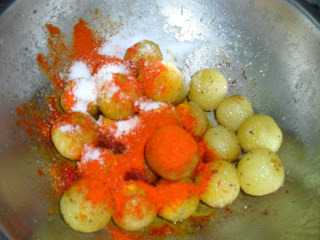 8.When the berries look slightly cooked add chilly powder, turmeric powder and the remaining salt. 9. Stir well for a couple of minutes until the raw smell is gone and switch off flame. 10. Cool the pickle thoroughly and add whipped curd. 11. Add the raw mustard and fenugreek powder and mix well. 12. Store in a clean dry jar. 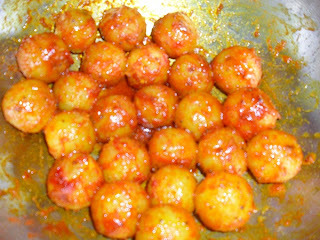 Allow the berries to marinate in the spicy curd for one day and then enjoy the Mor Nellikkai to your hearts content. Hituku Bele is a delicacy which is enjoyed through out the Kaalu season. Hituku Bele blends beautifully with any given dish, yet retains the distinct flavour and taste of its own. Field beans are first soaked in water for a long time.Then they are squeezed or pinched ( the process is called Hitukodu in Kannada ) one at a time so that the Bele / lentil jumps out of the skin! The process is laborious but the outcome is delicious. 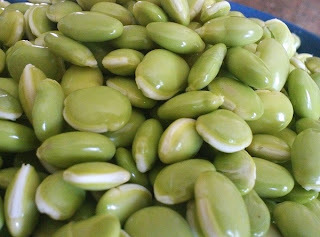 Now a days Hituku Bele is readily available in the market during the season. 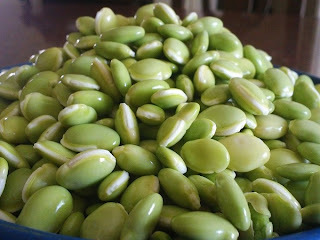 Here I present Hituku Bele in three delicious avataars especially for Sankranti / Pongal. 1. Wash and pressure cook rice with milk and two cups of water until three whistles. 2. Dissolve jaggery in three cups of warm water and filter. 3. Cook Hituku Bele in jaggery water adding the fresh coconut gratings to it. 4. When the Hituku Bele is just done add the cooked rice and blend well taking care not to mash up the Hituku Bele. 5. Add half of the ghee and cardamom powder and switch off flame when the Huggi/ Sakkarai Pongal thickens and emanates a very pleasant aroma. 6. 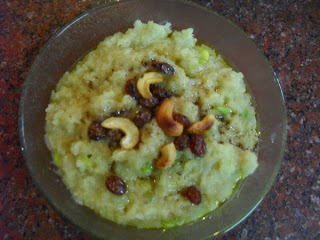 Heat the remaining ghee and fry the cashew nuts and raisins and garnish the Sweet Hituku Bele Huggi / Sakkarai Pongal. Offer the sweet Hituku Bele Huggi / Sakkarai Pongal to the Sun God on Sankranti and enjoy the delicious Prasaadam. 1. Wash and pressure cook rice with milk, turmeric powder and salt adding 2 cups of water until three whistles. 2. Heat sesame oil in a heavy bottomed pan and add the pepper and cumin seeds. 3. When the pepper and cumin seeds pop add chopped ginger and green chillies, followed by asafoetida and curry leaves. 4. Add three cups of water to the seasoning. 5. When the water starts to boil add the coconut gratings and the Hituku Bele and cook till the bele is just done. 6. 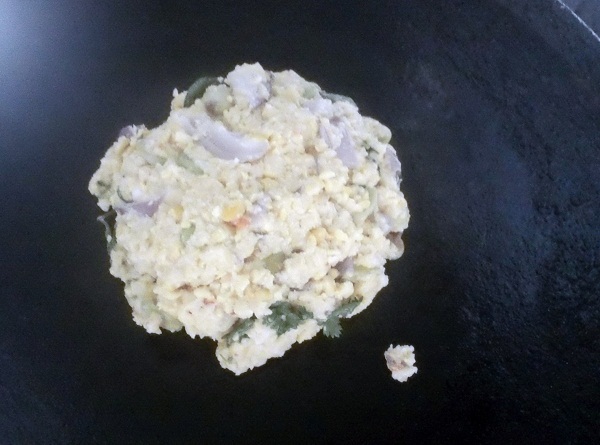 Blend in the cooked rice without mashing up the Hituku Bele. 7. 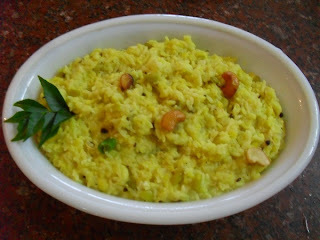 Cook till the Huggi / Ven Pongal emanates a very pleasant aroma and let the consistency be slightly loose like a porridge. 8. Heat ghee in a ladle and fry the cashew nuts till golden in colour and garnish. Offer the flavoursome Hituku Bele Huggi /Ven Pongal to the Sun God on Sankranti and relish the prasaadam with a tangy gojju. 1. Soak Black gram dal for one hour and drain. 2. Grind the soaked and drained dal with ginger and salt into a smooth and thick batter without adding water. 3. 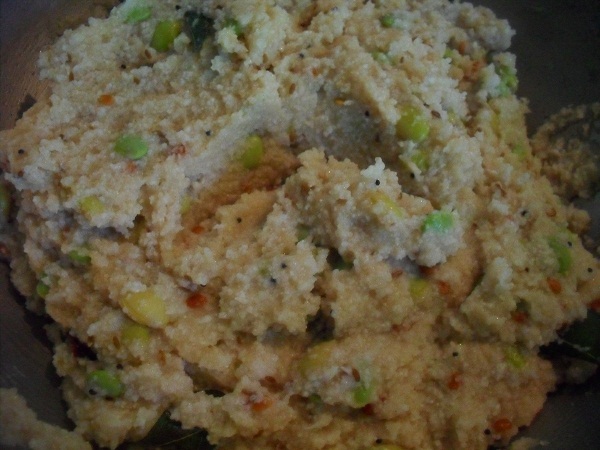 Mix crushed pepper, cumin seeds, green chillies, curry leaves, fresh coconut gratings and the Hituku Bele with the batter. 5. Wash your hands and place a ball of batter on your palm and pat it using the other palm, into a Vadae. 6. Make a hole in the center using a finger and gently slide the Vadae into the hot oil. 7. Cook the Vadae on medium flame till it is golden brown on both sides. 8. Remove it using a perforated ladle and drain on a paper towel. 9. 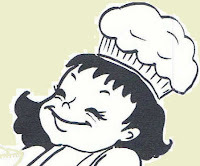 The Vadaes can be cooked in batches. But do not forget to wash and keep your hands wet before patting each Vadae, so that the batter does not stick to your palm while sliding it into the oil. 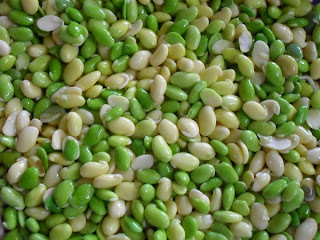 Enjoy the Hituku Bele Vadae with Savoury Huggi after thanking Sun God for the bounty on Sankranti. WISH YOU A VERY HAPPY AND PROSPEROUS SANKRANTI. 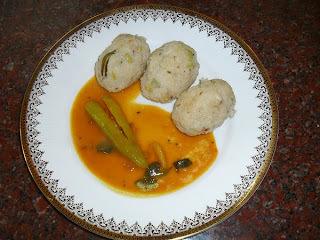 Kadubu ( Pidi Kozhukattai in Tamil ) was an oft prepared traditional dish during our childhood days. 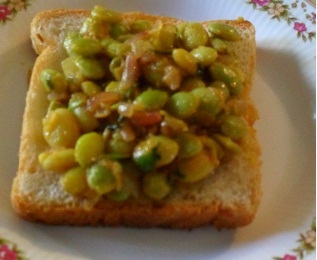 And Kaalu was a must in the dish during the season. 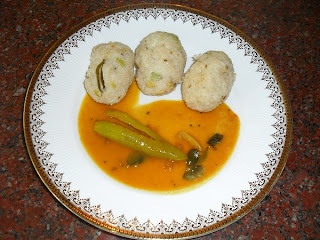 We relished the delicious 'Palagaaram' with our great grand mother who lived up to her 96th year. Now a days Kadubu /Pidi kozhukattai has become a rarity due to the hustle bustle of our daily routine. Children do not miss traditional dishes as they are overwhelmed by the multinational cuisines which are easily available now. 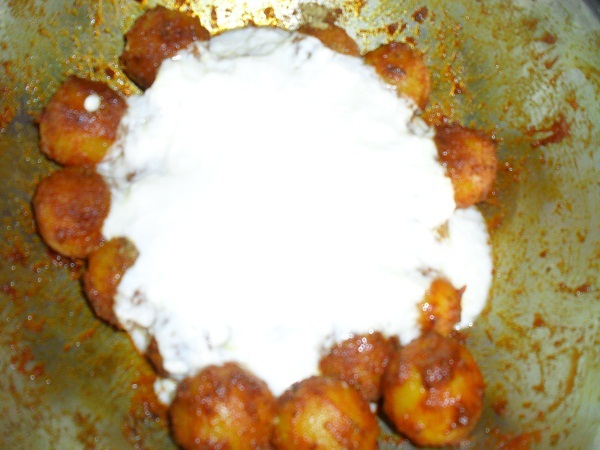 But my grand children did enjoy the treat when I prepared Kaalu Kadubu for this Kaalu series! 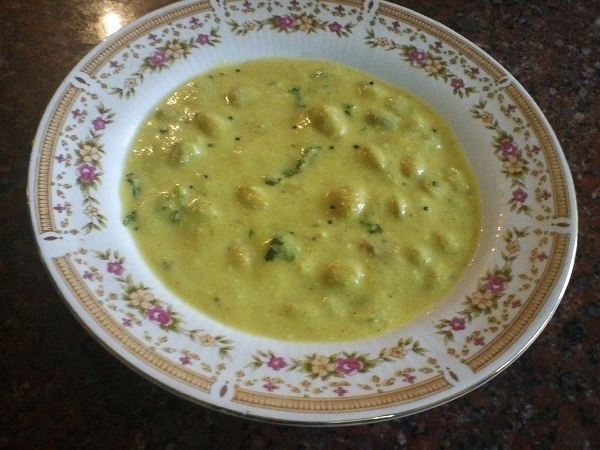 I have used red rice for preparing a healthy variation of Kaalu Kadubu / Kaalu Kozhukattai. 1. 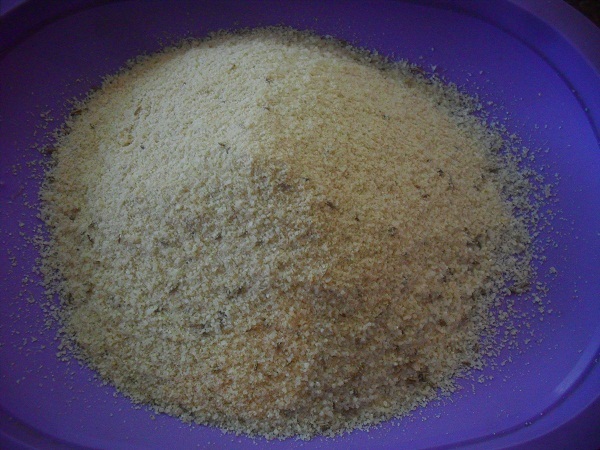 Grind red rice into a coarse powder resembling semolina. 2. Add cumin seeds and run the mixer for half a minute more. 4. When the mustard splutters add Black gram dal and the Bengal gram dal. 5. When the dals become golden in colour add broken red chillies, asafoetida and curry leaves. 6. Pour 4 cups of water into the seasoning and add the fresh coconut gratings, cooked Kaalu and salt. 7. When the water starts boiling lower the flame and gently add the broken rice and keep stirring to avoid lumps. 8. Increase heat and cook till the rice mixture comes together in a lump. 9. Grease the idly plates. 10. 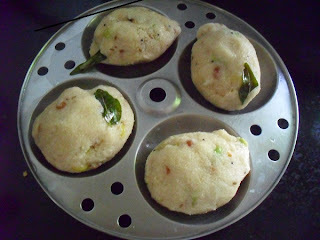 Wet your palms and scoop out a ball of the semi cooked rice mixture and shape it into a Kadubu / Kozhukattai. 11. Do not press too hard as it will make the Kadubu / Kozhukattai very hard. 12. Make all the Kadubus / Kozhukattais similarly, place them on idly plates and steam them in a pressure cooker for 15 minutes without the weight. 13. Open the lid when the steam has fully subsided. The Kadubus will tend to crumble when they are very hot. 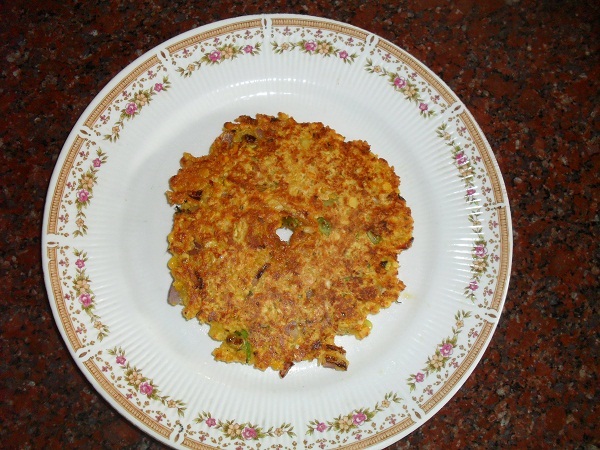 Carefully remove the Kaalu Kadubus / Kaalu kozhukattais and place them separately on a plate without piling them up together. Top the flavoursome Kaalu Kadubu / Kaalu Kozhukattai with a spoon of fresh ghee and relish with Green Chilly Puli Kozhambu. When my children were still in school, Christmas holidays were filled with great fun and excitement. Inspired by the pleasant weather my husband came up with sudden picnic ideas which thrilled the children. Some times it would be to a definite picnic destination, and some other time it used to be a pleasant long drive on the state high way where in we explored new places of our own for picnicking. Though we liked carrying various Christmas goodies from Nilgiris, and a crate of Fanta from B.G.C.,we always preferred home cooked food for the main course. Since Kaalu was always handy during that season, many a time Kaalu pulav with a raita was voted for as our picnic lunch. 1. Wash and drain the rice and keep it aside. 2. Heat oil in a heavy bottomed kadai. 3. Add cumin seeds, pepper corns, cinnamon, cloves and cardamom and fry till they pop up. 4. 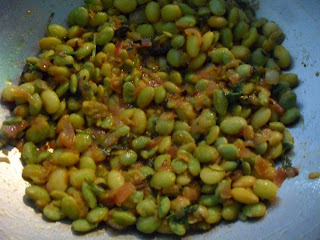 Add curry leaves, chopped onion, slit green chillies and ginger and saute till onion becomes pink in colour. 6. Add turmeric powder and then the washed and drained rice and fry till the rice starts sticking to the kadai. 7. Add salt and 4 cups of water to the fried ingredients and stir well. 8. When the water starts to boil, cover the kadai with a lid and reduce flame to sim/low. 9. 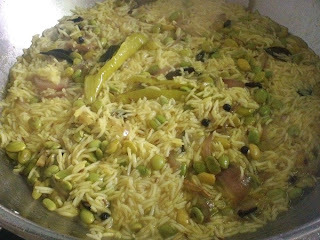 Open the lid after 15 minutes and stir the Pulav carefully (without mashing up the rice) for the even distribution of Kaalu and cover it again. 10. Switch off flame after five more minutes and your fragrant Kaalu Pulav is ready in 20 minutes. 11. 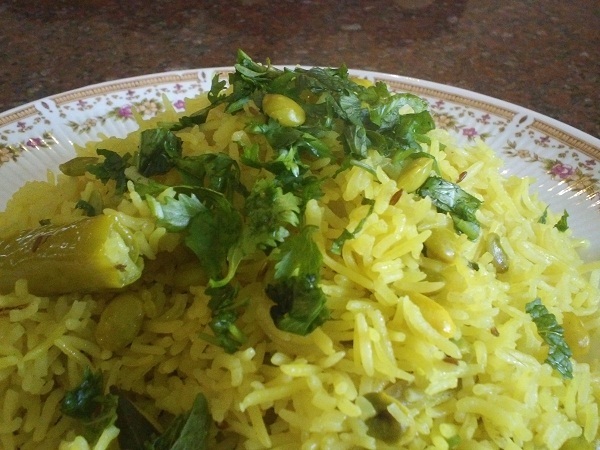 Shower the Kaalu Pulav with finely chopped fresh coriander and mint leaves just before packing/ serving. 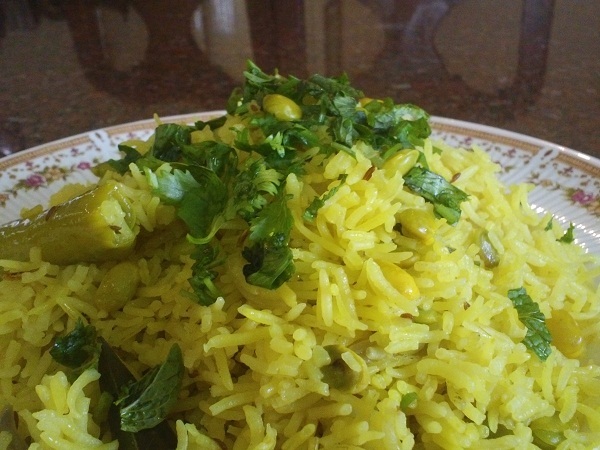 Enjoy the flavoursome Kaalu Pulav with onion and tomato raita. Paruppadai has become our regular breakfast dish because of its low G I. Onion Paruppadai, Cabbage Paruppadai or Paruppadai with fenugreek leaves taste delicious when savoured hot. One Adai is sufficient to sustain my husband till he finishes one round of his 18 hole golf game. Since it is Kaalu season Paruppadai with kaalu has become a regular feature on our breakfast menu. 1. For an early breakfast soak Bengal gram dal, Tur dal, Black gram dal and red chillies overnight. 2. 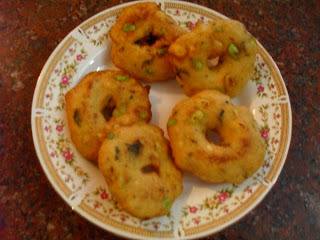 Next morning drain and grind the soaked ingredients with salt, asafoetida and peeled fresh ginger into a very coarse and thick batter with out adding water. Add cumin seeds and run the mixer for half a minute more. 3. 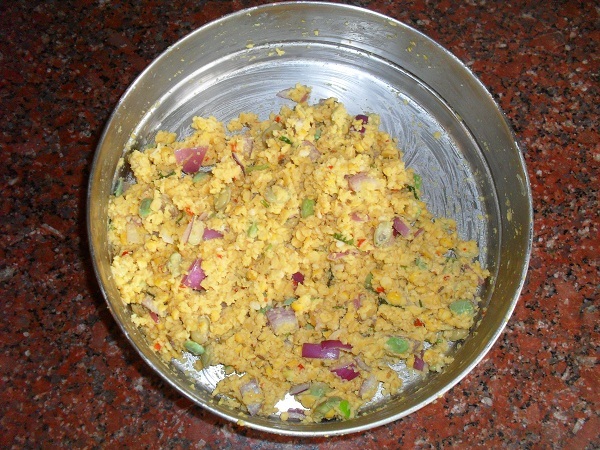 Mix chopped onion, precooked Kaalu, Chopped coriander leaves and the curry leaves into the batter. 4. Heat a greased tava and place a ball of batter on it. 5. 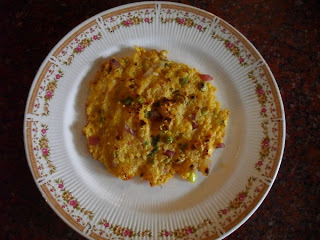 Using your wet fingers pat the batter gently and spread the Adai into a thick circle. 6. Make a hole in the center and add a drop of oil into the hole. Dribble little oil around the Adai and cover it with a lid. 7. Cook on medium flame for two to three minutes, open the lid and check if the batter looks cooked on top. 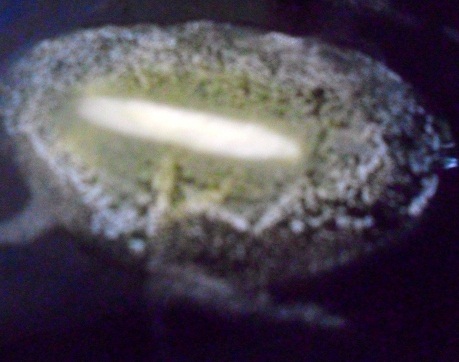 Lift it up lightly and check if the bottom of the Adai has turned golden brown. 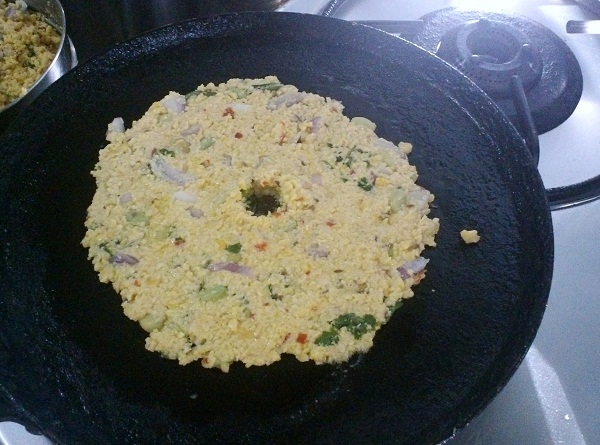 8.Flip the Adai and cook for one more minute dribbling few more drops of oil around it. 9. Remove when done and serve immediately. I prefer it as it is with a blob of butter on top of it ! Morkuzhambu is served with rice along with Sambhar on all joyous occasions like weddings and other festivities. Kaalu Morkuzhambu is not only a delicacy but it also adds beauty to a banana leaf meal where an array of other colourful dishes are served. 1. Cook Kaalu till tender and keep aside. 2. 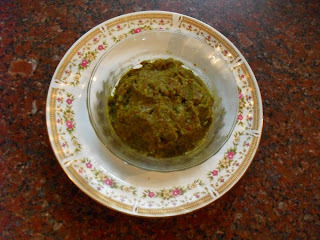 Grind coconut gratings with coriander seeds, cumin seeds and green chillies into a smooth paste. 3. 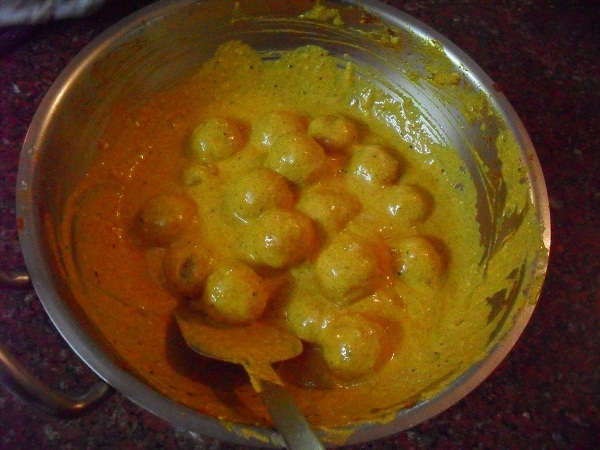 Add besan, rice flour, turmeric powder, salt and the ground paste to the curd and blend well. Add 1/2 to 1 cup of water if the blend is too thick. 4. 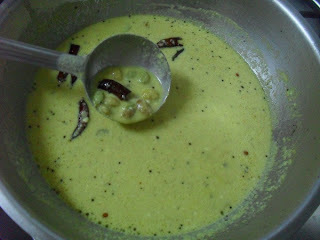 Add the cooked Kaalu to the curd mixture. 5. Heat oil in a seasoning ladle and add mustard seeds. 6. When it splutters add the fenugreek seeds followed by broken red chillies. 7. When the chillies turn crisp add asafoetida and curry leaves. 8. Add the seasoning to the Mor Kuzhambu. 9. Now cook the Kaalu Mor Kuzhambu on medium flame stirring now and then. 10. Switch off flame when the Kaalu Mor Kuzhambu is just about to boil and garnish with chopped coriander leaves. Enjoy the delicious Kaalu Mor Kuzhambu with steaming hot rice topped with a spoon of fresh ghee.